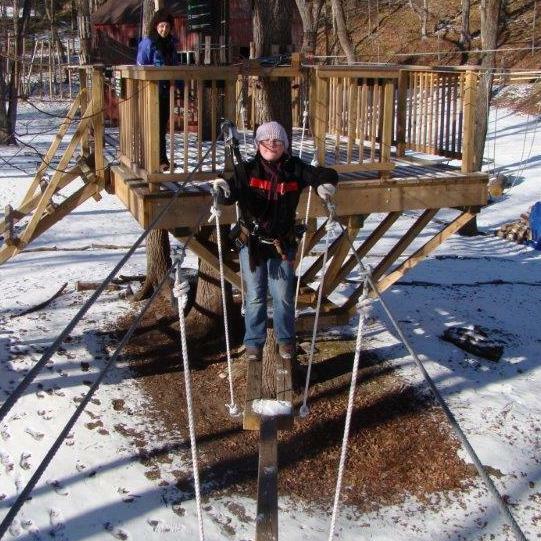 BUSHKILL, PA (WINTER 2015-16) – Pocono TreeVentures, the award winning aerial adventure ropes course in the Pocono Mountains offers 66 elements and five courses and is open year-round throughout the winter weather permitting. Gina Bertucci, spokesperson for TreeVentures said, “Our park offers aerial platform to platform challenges from beginner to expert. It allows guests the chance to surround themselves in the serene beauty of our wooded Pocono Mountain setting covered in a mantle of white.” A two night winter ropes course stay and climb package includes weekend accommodations in a studio villa within walking distance to Pocono TreeVentures, two ropes course tickets and two tickets for Pocono Zip Racer, the 1,000 ft dual racing zip line attraction, starting from just $209 per night. For Pocono TreeVentures package reservations go to PoconoTreeVentures.com where you can get additional aerial ropes course information and reserve your overnight stay. Pocono TreeVentures is open weekends and holidays throughout the winter weather permitting.